Animated film-Can explain something in a light hearted way. An animated video is well suited to explain how something works, for example, an organization, or a service. One of the advantages is having the ability to add different items to explain things. Our strength is that we are creating new objects that therefore will be customized. 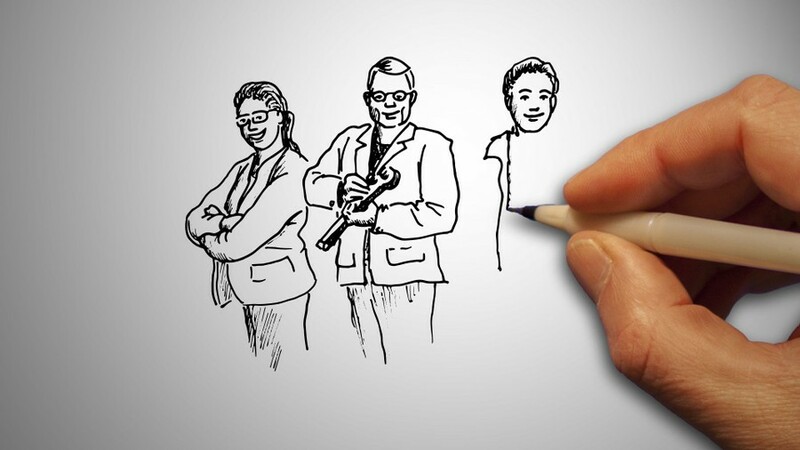 This means that we animate from scratch and are also able to do animation drawn by hand. Most of the films we produce are 2D animated but we are also able to make 3D animated video. One advantage of animation is that it can have a long life. In a ordinary film, there may be machines that get old or staff replaced. Another advantage of animation is that it is easier to make a film that is a bit lighter and with a bit of humor. Then it will be easier to get the viewer to stay for the entire message. To make a really good animated film a text with a message is needed as a starting point for a image script. You can start by writing a list of points with the most important information that the film needs to answer. These points you develop into strong sentences. Filmbyggarna can help and read through the text and provide feedback. We also need your graphic profile with your logo and fonts to give the film the right touch. Most of the animated movies that we've done has been around 1-2 minute long. When the text is completed, one of our animators make you a Storyboard. We go through the text and decide together what kind of pictures to illustrate the text. We will also decide on the style of your animation. One good tip is to watch animated movies on Youtube for inspiration. Many other animators buy finished objects as they put together a film. These films are often impersonal and is therefore difficult to give a feel-good feeling because they all look like each other. Our strength when it comes to animation is that we start from your company and animates images from scratch. It gives a more artistic style and a sense of quality. You can send our animators pictures of objects that we agreed on for approval. In almost all animated films, we have set a voice-over. Filmbyggarna have cooperation with a dozen voice-overs that we usually use. Therefore it will be easier for us to cooperate and give instructions. We also have high demands on sound quality and we usually get our texts read and then delivered in audio files on 1-3 working days. Since many of our customers are working internationally, we have contacts with English voice-overs and a variety of other languages. We give some suggestions on a few voices that we think will fit, and after your choice read the text. Then we animate the film as you may give feedback on and so we adjust according to your wishes.